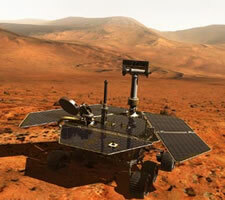 Scientists have been baffled by a mysterious boost in power to one of its two robotic rovers which are exploring the surface of the Red Planet. Overnight, Opportunity's solar panels produced between 2% and 5% additional power, perhaps due to Martian dust that had settled on them being removed. This may be increasing the efficiency by which the panels convert sunlight to electricity in order to power the rover. One theory is that a storm, or dust-devil, blew dust off the panels. 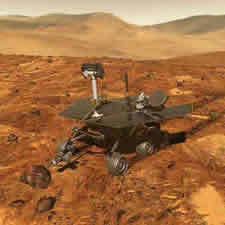 But for now, mission scientists are saying only that Opportunity underwent two or three significant "cleaning events." Opportunity and its twin, Spirit, landed on opposite sides of Mars back in January, but they remain in good shape after enduring the worst of the Martian winter, which cut down on the amount of energy reaching their solar panels. Both robotic explorers have discovered geological evidence of past water activity on the Red Planet and are continuing to send back valuable data. 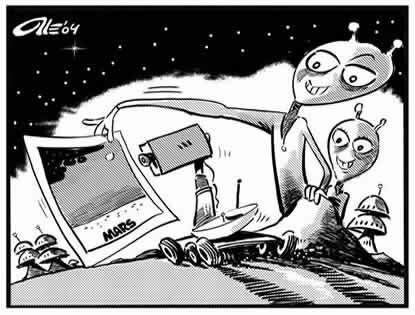 "We are pushing these vehicles to their very limits," said Steve Squyres, rover principal investigator from Cornell University in Ithaca, US. "In many ways they are performing better in some sense just because we've gotten better at operating them and we are in this much more challenging and geologically rich terrain."